Port Blair, July 25: A delegation of Port Blair Municipal Council led by its Chairman, Shri PB Murugan called on the Lt. Governor, Lt. Gen (Retd) AK Singh at Raj Niwas yesterday and apprised him of the functioning and challenges being faced by the Council. During the meeting, the Lt. 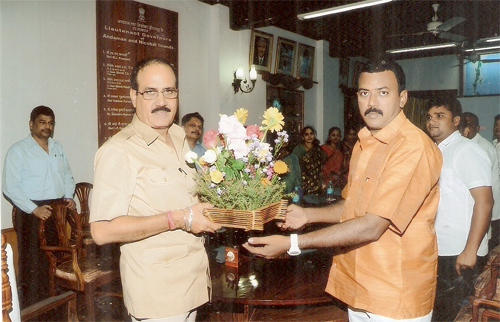 Governor appreciated the sanitation in the town. The LG has also assured full support of the Administration for the proposal of creating a UFO Digital Cinema at Dr. B.R. Ambedkar Auditorium by 15th August 2013 and for implementation of SWM Rules, a communication from the office of Chairperson PBMC said here.